I love your blog and find your fashion sense amazing. In fact I find your blog best among all Indian fashion bloggers. I have enclosed my picture in traditional getup as it seems to match the mood of your recent posts. Please do give your suggestions on my outfit and what do you think overall of them. 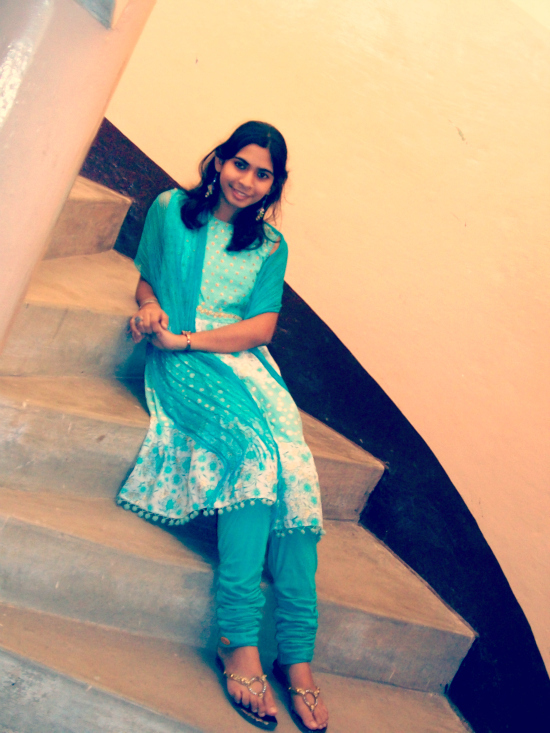 The pic where I'm wearing the anarkali suit during school program. That is so kind of you. I am glad you like my blog and Thank you for sending in your picture. I really like the color of your outfit. It is soft and pleasing. However, I can't see the 'anarkali-effect' in this post but the floral print is so on trend in spite of being an Indian outfit. I am sure you looked great at your school event. Thank you everyone who has sent their pictures for the Reader's Spotlight. I will continue to post them on Friday in the order that I have received the email. If you are new here: this is a segment where my readers get to share their style or ask of suggestions (if they need any!) from all my readers. So if you have been inspired by my blog then Email me your outfit pictures for this feature. If anyone wishes to stay Anonymous just say the word!